Summer is the season of tie-dye and anything is game! How about a pair of TOMS? They are perfect because they come in white cotton, which takes the Tulip dye beautifully! Check out my video to see how I made these! that's neat! just tie dyed a bunch of kid tees and baby onesies. didn't even think about dying shoes. 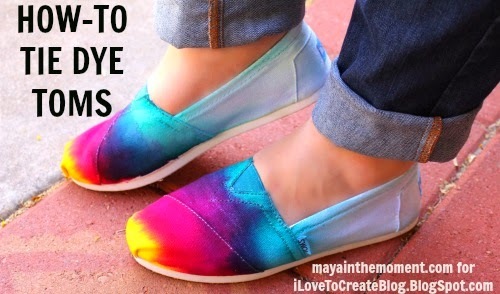 i will probably run out to buy a pair of chuck taylors or keds and tie dye them!